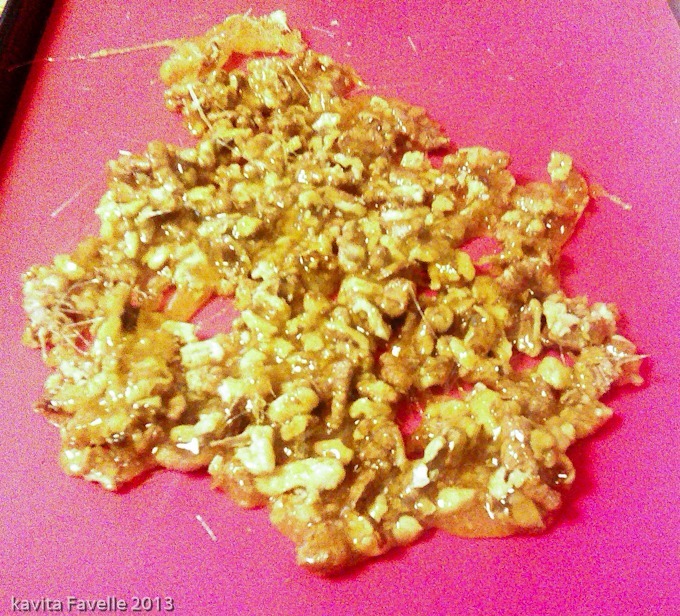 Having decided to make myself some Coffee Rum & Walnut Brittle Ice Cream, the first step was to make the brittle. 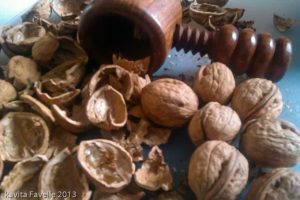 I knew I had a bag of French walnuts sitting in the airing cupboard, gathered from the grounds of a friend’s home in Corrèze, dried in the sun and delivered to me as a very kind gift last year. You can adapt this to the weight of walnuts you have available. Weight your nuts, use double that amount of sugar, and adjust the amount of salt accordingly. Line a baking tray with a silicon baking sheet or a sheet of parchment paper. Break the walnuts into small pieces, though take care not to crush them as you’re not trying to make powdered walnut! In a large, heavy-based pan dry fry the walnut pieces for a minute or two to give them a slightly toasted flavour. Take care not to burn them. Remove to a bowl and set to one side. 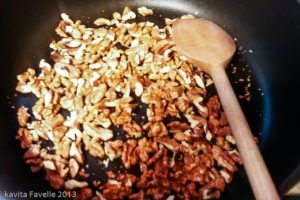 Wipe the pan clean of walnut skin and then spread the sugar and salt evenly over the surface and heat over a medium flame. Don’t stir the sugar, just leave it alone to melt. Stirring tends to result in clumps that don’t melt evenly, as I remember all too well from previous caramelising efforts! 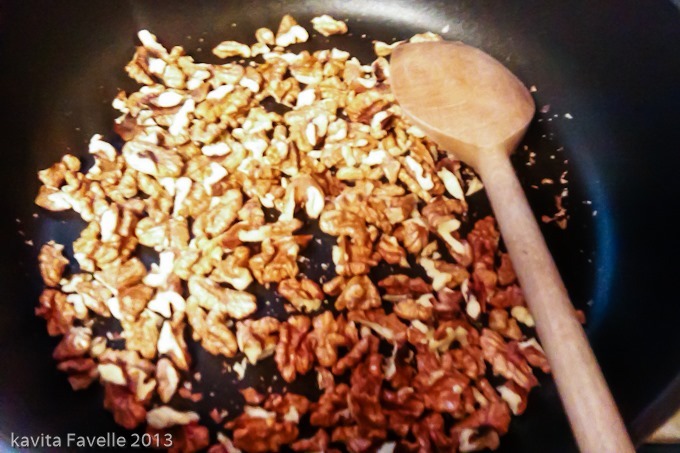 As soon as the sugar melts and takes on a rich golden brown colour, remove from the heat and stir in the walnuts. 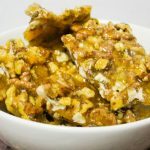 Work really quickly as the mixture will cool and harden fast and you need to distribute the walnuts evenly throughout the caramel. Transfer the mixture onto your lined baking tray and spread it out quickly. Once set, break intro manageable pieces and store in an airtight container. You may like to ask someone to hide the box from you so that you don’t eat the lot in one sitting. You may also like this recipe for Coffee Rum & Walnut Brittle Ice Cream! 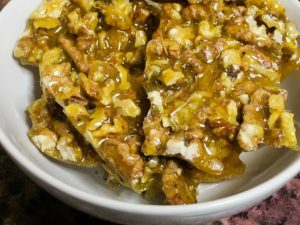 11 Comments to "How To Make Walnut Brittle"
Think I’d need to ask someone to hide the box for me. This looks so delicious. I’ve made caramalised nuts a few times now, but a) have not thought to use walnuts and b) have not thought to use salt. Just wondering if I might find some time to make some ice-cream – haven’t made any or entered your challenge for ages. Never mind hide the box, what about hide this recipe? 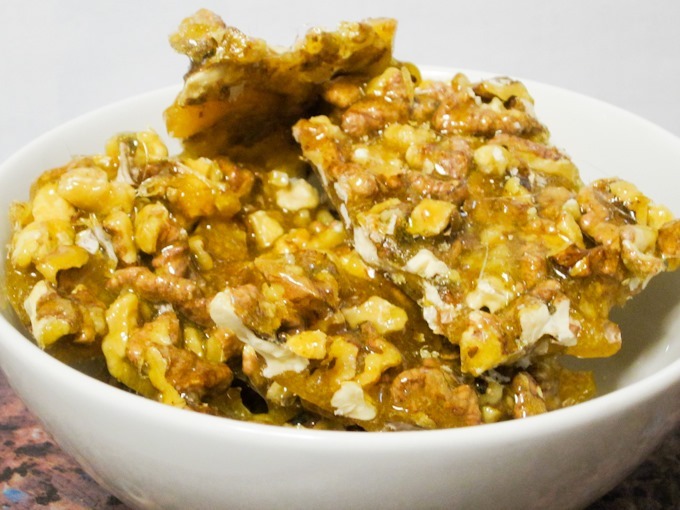 We ate a ton of nut brittles in Burma and you can never just have one piece…. Like I’m going to bother making ice cream once I’ve made these beauties?! Ha ha! They are going to be all for me and scoffed greedily when no-one else is around. They look fantastic! Hope you enjoy them, Snig! WOW this looks amazing!! I am so making this. Love the idea of date ice cream, how genius! This looks really good but I find walnuts so expensive at the moment. Even in my local Turkish shop the prices are ridiculous. Any suggestions on where to buy more cheaply? I adore any kind of nut/caramel/praline/brittle combination and this looks like no exception, yum!